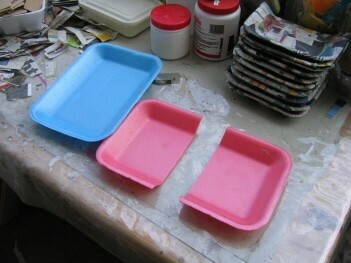 Usually I keep some polystyrene-food-trays, as well as other package materials to use them for mixing colors etc. But I had collected too much of them, so I decided to convert them in something useful. 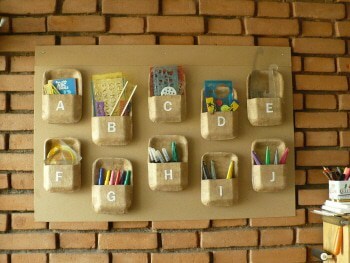 Looking at the size and shape of the trays and their possibilities, I came to the organizer design. I used one and a half tray for each pocket, as can be seen in the photos (I uploaded the whole process is on the flickr set). Covered them with newspaper strips, before gluing them together (this because working on the inside afterwards, would complicate things to much). At that point I decided not to paint the finished product, but to leave it with brown paper on top. So, I covered the insides of the walls with brown paper and glued them together, then layered the outside with brown paper. Ripping the strips of paper gives a nicer finish, than cutting them, as I noticed on the way. I tried several ways of putting the ten pockets together; it is of course possible to put less and in different designs. 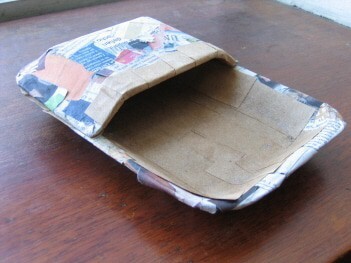 The cardboard was the only thing I did not have â€”with the right sizeâ€” at home, it costs about $2.00 I glued the pockets to the cardboard and secured them extra, with three staples, with the help of a stapling gun. Covered the staple points, with pieces of brown paper. Decorated each pocket with some letters printed on old magazine pages and cut. Covering plastic trays has the advantage of not having the warping problem, but sometimes the first layer does not stick well to the tray after drying. I would recommend to either sand them a little, before covering, or use the undiluted thick glue on the first layer. I used diluted PVA glue, all the way.